We've noticed our players enjoy grouping up to fight ships together, so we've added three new turret bosses to the game that are meant to be a multiplayer experience out in the Skyways. Turrets are towers in the skyway that attack up to 4 ships at a time and have a large amount of health. Be on the prowl for the turret bosses in Cool Ranch, Mooshu, and Marleybone—your Nautical XP Parties will definitely be more exciting! First, I have to say that I think it's awesome that Kingsisle realized people enjoy NXP parties so much and created a way to encourage this. The turret bosses offer a bigger challenge than anything else we have seen in the skyways so far. However, they are also easy enough that I was also able to solo all three on my own, with the help of an Aquilan ship. And they are supposed to drop awesome ship parts too. However, I wasn't lucky enough to get anything except gold. Now, this is just my opinion, but I would have to recommend farming these either solo or as a small group (2-4 people). And here is the reason why: The respawn rates are really too long for an NXP party. 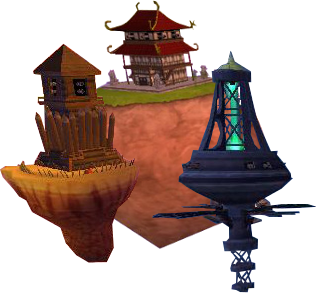 The Cool Ranch and Mooshu turrets both respawn after about 7-8 minutes. However, the Marleybone one has a much higher respawn time - 12ish minutes. So this is what an NXP event looks like with a group of 15-20+ ships battling these bosses. The turrets are defeated in about 30-45 seconds, maybe less. One player chooses an new realm and everyone switches, so they can stay together. No turret there either. Wait 60 seconds and switch to another realm. No turret there. Repeat until you find a realm with the turret. At the NXP event I had last week, we spent about 75% of the time looking for realms that had the turret in it. This created a lot of down time, which in my opinion kinda takes the fun (and NXP) out of these types of events. So my suggestion is to farm these, but keep the groups smaller. Then it will be easier to check realms without having to worry about getting separated. For larger NXP events, stick with the higher level ships in Aquila. There are bosses there with amazing drops, much higher NXP and lots of other ships to fight while waiting for the boss to respawn (about 2 minutes instead of 12). My suggestion to Kingsisle is to maybe decrease the respawn time to something more similar to the ship bosses (2, 3, even 4 minutes) and possibly add more ships in the general area (Cool Ranch has this option). That way there is less down time while battling, and people have more opportunity to get NXP while at these events. The items that are dropped are rare, so I think the drop rate is probably fine. But in my opinion, the turrets need to be more readily available for farming.